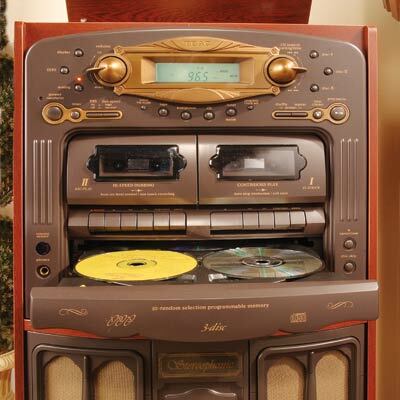 A complete home stereo system with an appealing nostalgic design. Are you a nostalgic music fan who fondly remembers the radio consoles of the 40’s and 50’s? Do you remember sitting with your parents and grandparents listening to your favorite shows in the evenings? Did you dance around your living room to the new and evolving musical genre being called rock ‘n roll? Reminisce no more of days gone by and delight in our Retro Console Music System. This beautifully designed system combines the most modern of components with a retro style design. This musical wonder is housed in a classic wooden paneled, four legged cabinet, complete with old fashioned speaker panels in the lower front. Situated above those speaker panels are the modern, and some that will take you back in time a few decades, musical components.